The huge Qingdao Bay Bridge is the largest sea bridge in the world and opened in June 2011. It was built to provide better links between the two fast growing industrial areas either side of the bay. Qingdao Bay Bridge spans the Jiaozhou bay, and has a minimum lifetime use of 100 years. The Qingdao Bay Bridge spans across the Jiaozhou bay, which connects the eastern and western areas of the Qingdao region in China. The 41.58km bridge, the longest sea bridge in the world, was opened in June 2011 after four years of construction. The bridge shortens the distance from Qingdao to Small Qingdao, Red Island and Yellow Island by 30km. The travel time is expected to be reduced by 30 min. More than 30,000 vehicles are estimated to use the bridge each day. The Qingdao Bay Bridge was built as part of the strategy to provide better connectivity between the two fast growing industrial regions on either side of the Bay. Qingdao, as one of the opened coastal cities, was playing a key role in the country’s development strategy. The Huangdao region was connected to the city of Qingdao through a ferry service across Jiaozhou Bay. The three-ferry service was becoming insufficient because of the rising passenger and cargo levels. The bridge is part of the Expressway Bridge and Tunnel project of Qingdao municipality and forms the starting point of the Qingdao-Lanzhou Expressway. The six-lane bridge is 41.48km long including the approach span and the linking way. The design involves three channel bridges – Cangkou, Red Island and Dagu Channel. The Cangkou bridge spans 260m, and the Red Island bridge spans 120m. Cangkou Channel Bridge is the first ocean interchange in China. Cangkou and Red Island are cable-stayed bridges, while the Dagu Channel Bridge is a single-tower self-anchored suspension bridge. It spans 260m. It claims to be the first self-anchored suspension bridge in the world with a single tower. The tower is 149m high. The Jiaozhou bay tunnel runs beneath the Qingdao Bay Bridge. The 5,550m tunnel was opened along with the bridge. The six-lane two-hole tunnel was constructed over 3.5 years. The construction of the bridge, which began in 2007, used 450,000t of steel and 2.3 million cubic metres of concrete. More than 20,000 people were involved in the construction, which started from both ends at the same time and was then connected at the centre. The construction was undertaken in two phases. Phase I covered 28.8km while phase II covered 12.7km. Phase I involved the construction of the Cangkou bridge, Red Island bridge and Dagu Channel bridge. Yellow Island and Red Island wiring, two interchanges at Licun River and Red Island, three spans and toll stations in Qingdao were also constructed under this phase. This phase was completed in December 2010. Phase II involved the construction of the road on the bridge, power supply and distribution, fencing, lighting, housing and landscape. The bridge was designed by Shangdong Gausu Group. 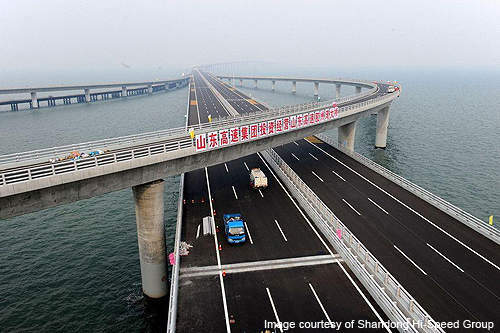 Shandong Hi-Speed Qingdao Highway, a subsidiary of Shandong High-Speed Group, was appointed to construct, operate and manage the bridge. They will do so for 25 years. 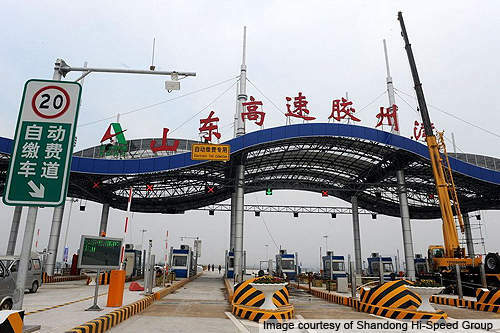 The company also owns the toll collection rights for the Jiaozhou Bay Expressway, the advertising operation rights and tourism development and operation rights of the Qingdao Bay Bridge and Jiaozhou Bay Expressway. The bridge has the ability to withstand earthquakes of 8.0 magnitude, as well as strong typhoons and the impact of a 300,000t vessel. The Jiaozhou Bay has an annual ice period of 60 days. The bridge is the largest to be constructed on frozen waters in China. The bridge is expected to have a minimum lifespan of 100 years. The project has 5127 punching bored concrete piles, which is a world first.